Berkery Noyes Handles Sale of TFM Trade Show to Hanley-Wood - Berkery, Noyes & Co., LLC. NEW YORK, May 1, 2008 — Berkery Noyes, the leading independent investment bank serving the information, media and technology markets, announces that it represented Group C Communications, Inc. in its sale of The TFM Show®, the nation’s premier tradeshow for senior facility management executives, to Hanley-Wood, LLC, the leading event producer serving the commercial and residential construction markets. The TFM Show is the best-attended global forum for facilities management professionals and vendors, offering a comprehensive program including educational courses, an exhibit hall featuring the latest facility products, services, and technologies, networking events, and unique facility tours. The 2008 TFM Show was held April 22-24 at Chicago’s Navy Pier. Group C Communications, based in Tinton Falls, NJ, is a diversified business-to-business media company including national magazines, events and web communities primarily serving the facilities management market. The transaction announced today, for which terms were not disclosed, involved only The TFM Show and its related web sites. 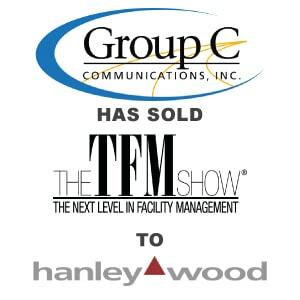 “There is a compelling strategic logic to co-locate The TFM Show with Hanley-Wood’s market-leading CONSTRUCT2009 event next year,” said Kathleen Thomas, the Berkery Noyes managing director who orchestrated the transaction on behalf of Group C. “The co-location of these events creates a more important event for the customers of both.” adds Mai-Anh Tran, the Berkery Noyes Vice President on the deal. Based in New York City, Berkery Noyes provides strategic mergers and acquisitions transaction advisory services, financial consulting and strategic research to middle-market information, media and technology companies in the United States and internationally. Kathleen Thomas, head of the firm’s Media, Information and Marketing Services Group, specializes in mergers and acquisitions for the B-to-B media, conference, trade show and event markets. For more information, visit www.berkerynoyes.com. Group C Communications, Inc. is a NJ-based national media company with more than 39 years of experience providing information in the areas of facility management and real estate. Through its publications Business Facilities and Today’s Facility Manager, Group C reaches facility managers and top-level executives who make significant decisions involving the long- and short-term needs of their companies and facilities. Group C also offers targeted face-to-face networking and valuable educational opportunities through products such as Business Facilities LiveXchange and The TFM Forum. Hanley Wood, LLC is the premier business-to-business media company serving the housing and construction industries. Through its four operating divisions, Hanley Wood produces award-winning magazines and web sites; distributes stock home plans; operates marquee trade shows and events; collects and analyzes industry data; and creates custom marketing solutions. Founded in 1976, Hanley Wood is owned by a consortium of investment firms led by JPMorgan Partners, LLC. CCMP Capital Advisors manages the Hanley Wood investment for JPMorgan Partners. Hanley Wood Exhibitions (Dallas) operates 17 industry-leading trade shows including World of Concrete, one of the top 20 trade show events in the United States. Buyer Parent: J.P. Morgan Chase & Co.